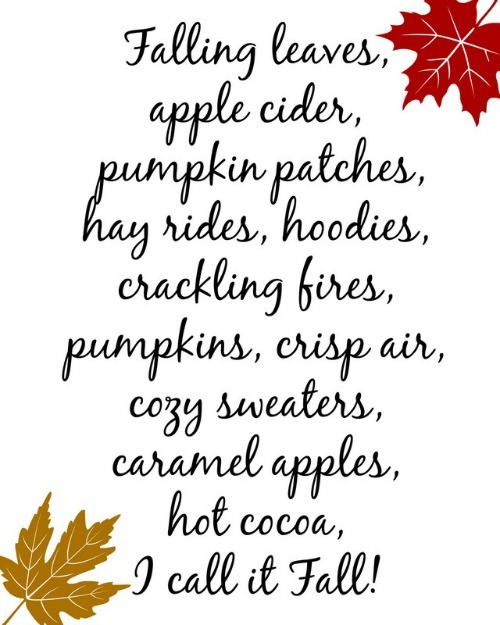 Fall is definitely on its way here, and it is indeed time for pumpkin spice everything. And we just love it! We can’t help but get caught up in the magic of autumn, and often that involves some serious crafting, and some drastic décor changes. If you love to change up your décor come autumn, and you love an easy DIY (we know you do!) and you don’t want to spend a fortune on it, have I got a great collection for you! 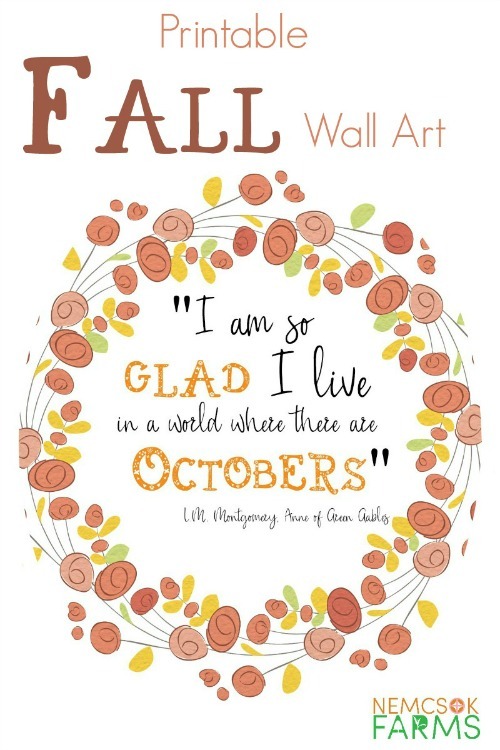 Check out these 15 Gorgeous Fall Wall Art Printables! Easy, simple wall art is a great way to spice up any room. 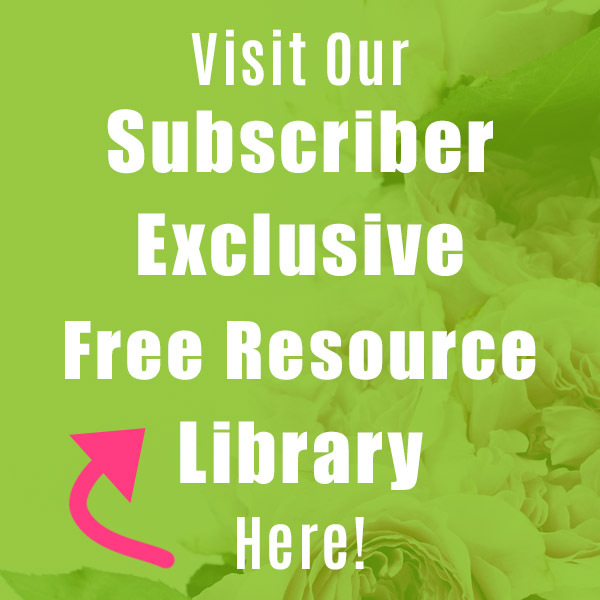 And when you consider that you can get tons of free printables that make gorgeous wall art, all you really need to do is pick your favorite. I guess that right there might prove to be the hard part actually. 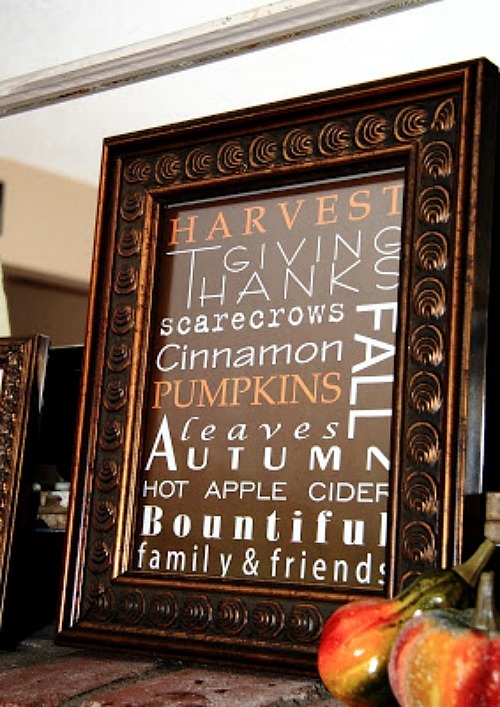 Ah what the heck, check out these 15 autumn wall art printables and print them all! They would make great gifts for parents, friends, and grandparents! They would also make great hostess gifts too! 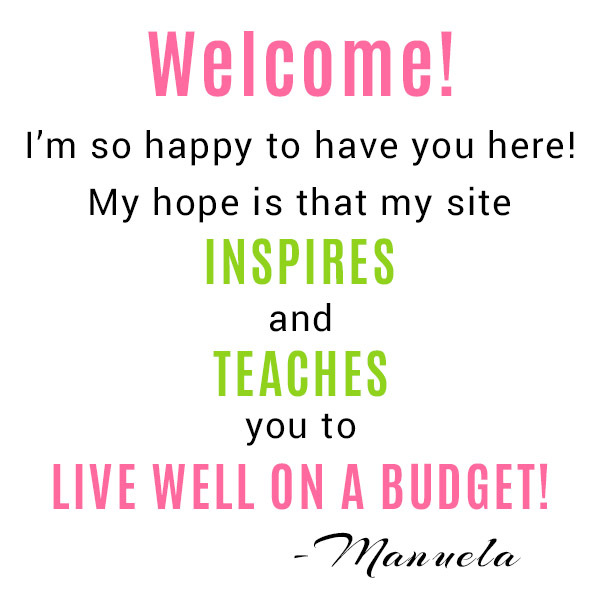 From some really simple welcome and hello signs, to a few elegant quotes, there are a handful of ideas for you to add some fabulous glamour to your space. Also, we have found some inspiring messages, and some fun expressions. 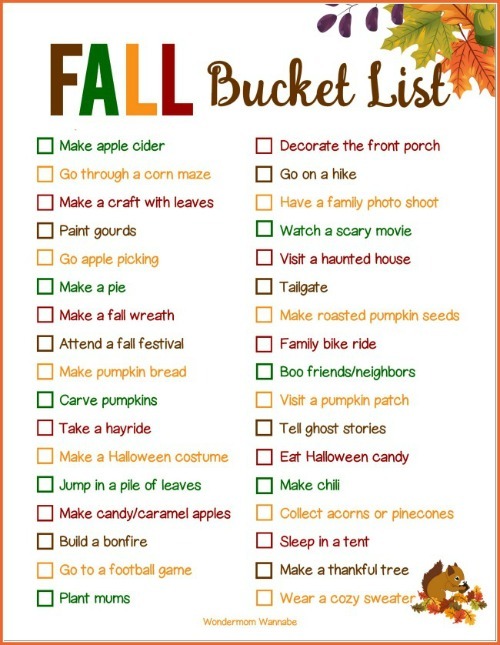 And don’t leave without grabbing a copy of the Fall Bucket List and the Halloween Countdown at the bottom of the list! 1. 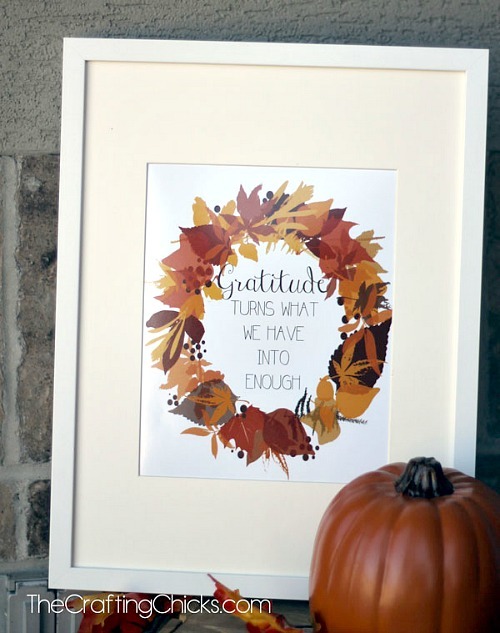 This Gratitude Fall Printable by the Crafting Chicks is just splendid. It would look lovely in any dining room, family room or kitchen. 2. 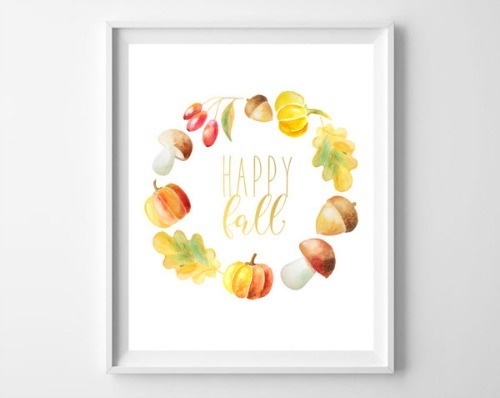 This simple Happy Fall Printable by Burlap and Blue is lovely, and would make a great gift! 3. 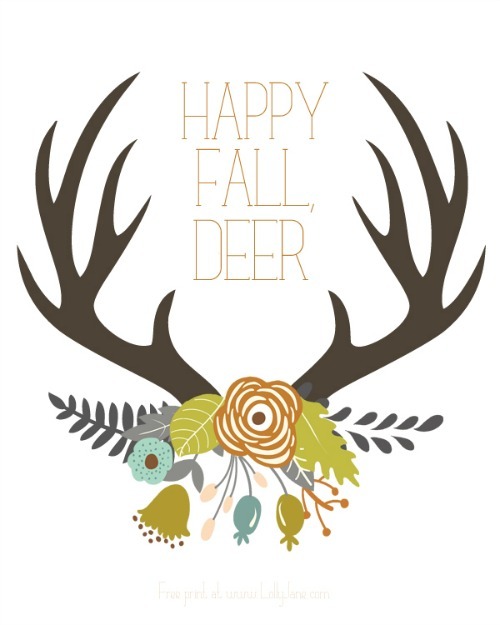 I love this Fall Antler Art by Lolly Jane! It’s so pretty and so punny! 4. 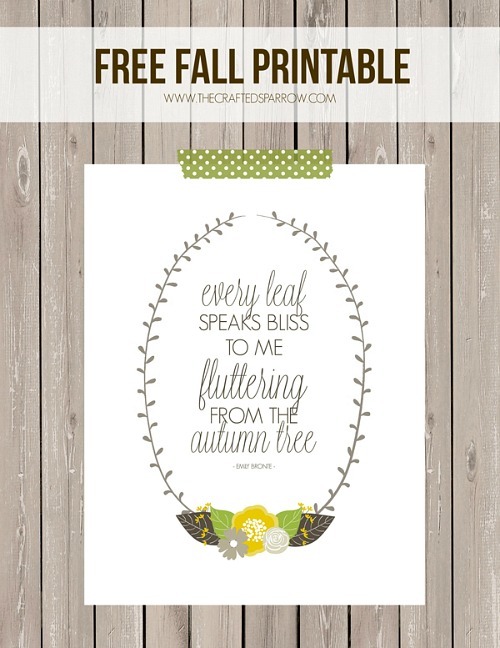 This simple I Call It Fall Free Printable by Craft O Maniac poem screams family room to me. 5. 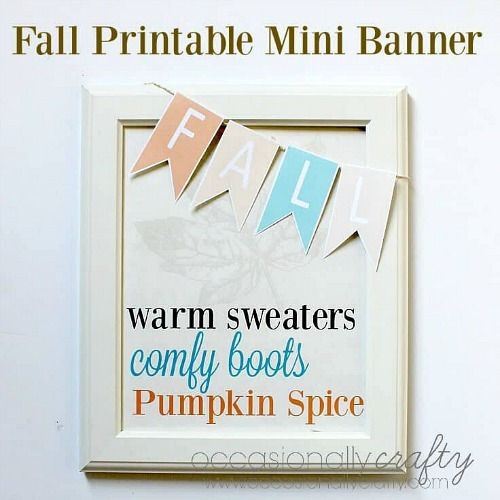 Kennary’s “Warm Sweater and Comfy Boots” Fall Printable with Mini Banner makes a nice addition to the fireplace or the front entrance. 6. A subway style Fall Mantle by Yellow Bliss Road reminds you of all the things you love about fall – and looks beautiful. 7. 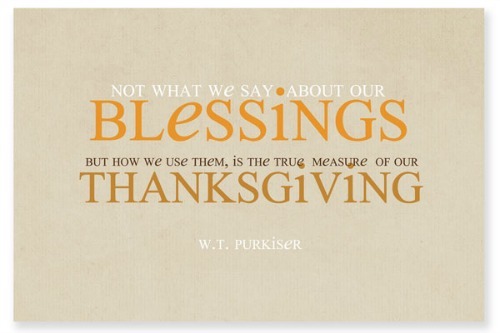 I love the message in these Thanksgiving Printables by Simple As That – plus there are also some adorable printable toothpick tags as well, that you have to see! 8. 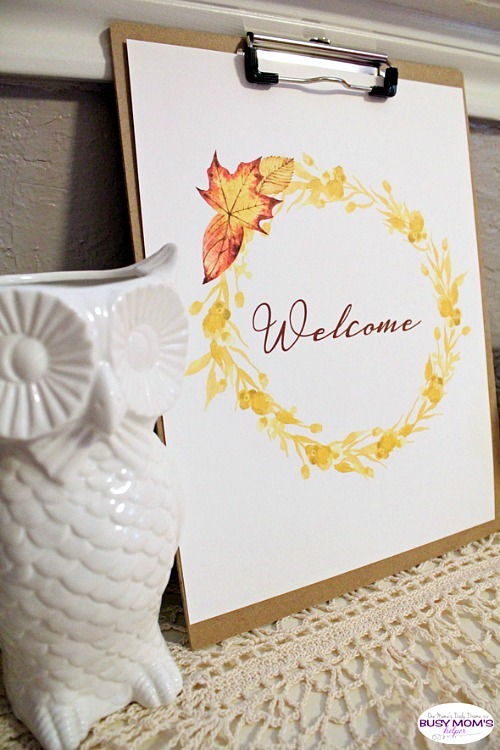 Another simple Welcome Fall printable by Busy Moms Helper would frame up nicely for a great gift. 9. Here’s that Printable Fall Bucket List by WonderMom Wannabe I was telling you about! Print out and frame a few among friends, and turn it into an October thing. 10. Speaking of Octobers, this famous Anne Shirley quote about A World Where There Are Octobers by Nemcsok Farms is just so pretty. 11. I just love this Autumn Tree Free Printable by the Crafted Sparrow. It really is gorgeous and inspiring. 12. 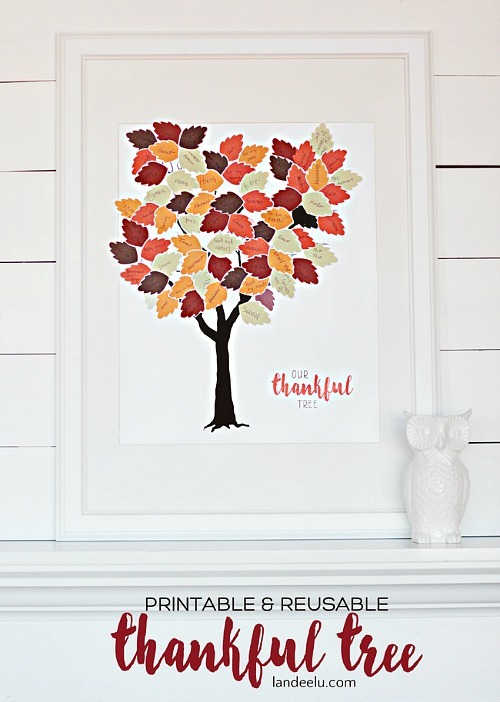 This Thankful Tree Printable by Landeelu would make a wonderful family project to finish in time for Thanksgiving. It would also be great to finish up for as a gift for Grandma and Grandpa. 13. 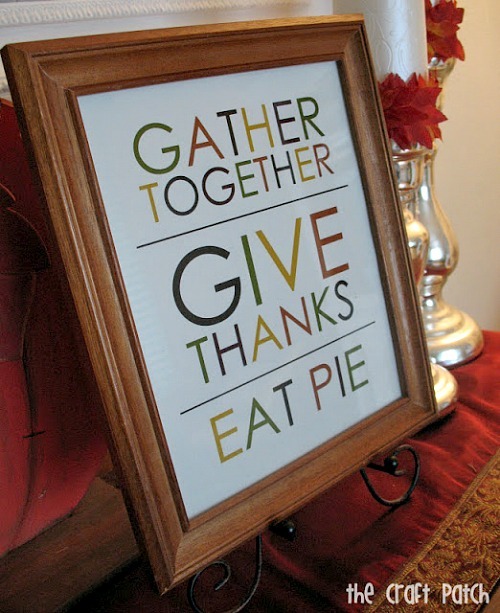 This quippy wall art Give Thanks Eat Pie Printable by the Craft Patch makes me happy, and long for pie at the same time! 14. 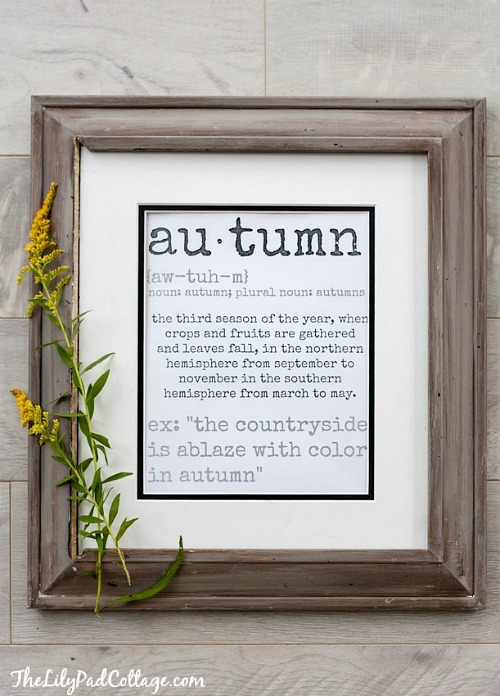 A dictionary style Autumn Printable by the Lily Pad Cottage would also look great in any kitchen or family room – or even in the mud room. 15. 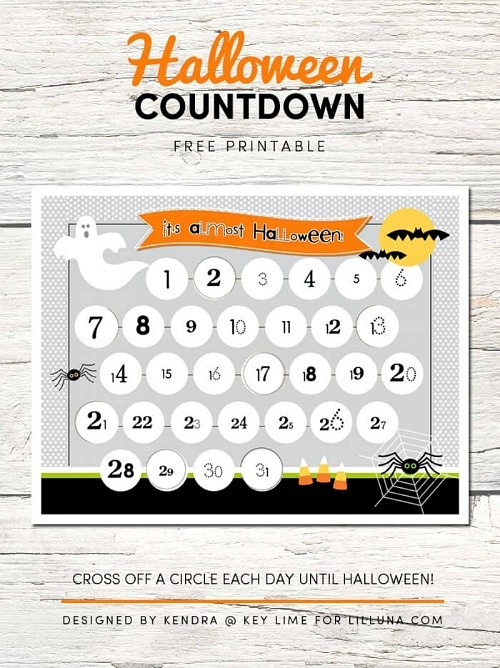 And what would a list of fall printables be if it didn’t include this Halloween Countdown by Lil’ Luna, because let’s be real, fall is really all about Halloween. First, you’ll probably want to print these autumn art prints on cardstock or matte photo paper. But don’t fret if you don’t have any – as it really depends on what you have in mind for the finished project. In many cases, normal printer paper will do just fine. Also, most of these would look lovely framed. You can buy inexpensive dollar store frames, second hand frames from yard sales etc, and you can even DIY some fabulous frames. Wood transfers with any of these printables would look pretty sharp also, and would make really great conversation pieces. Really, the possibilities are endless! If you don’t have a color printer, you can visit your local library, hit up a friend, or try a local business depot. But printers are cheaper than ever these days, with some costing less than $50 (this is the newer version of the one I have, but I think it’s cheaper than mine was)! 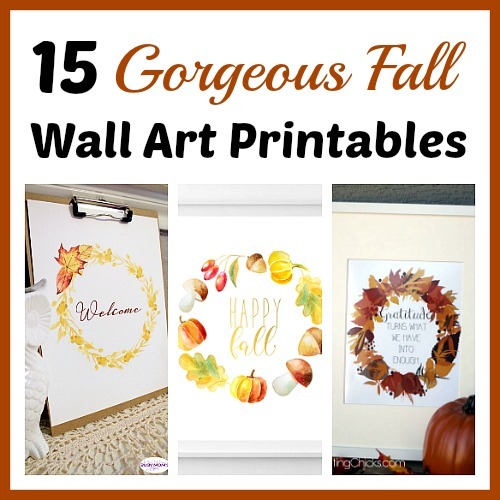 If you think that you might like to make your own fall wall art printables to use in your home (or to sell for some extra money! ), check out the Digital Download Shop on Etsy (affiliate link). There are tons of great clipart graphic resource packs there to help you get started quickly. 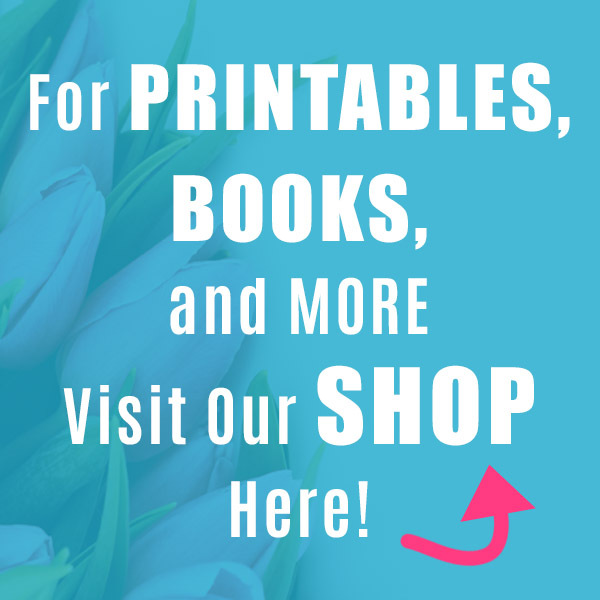 Do you often use printables to decorate your home? 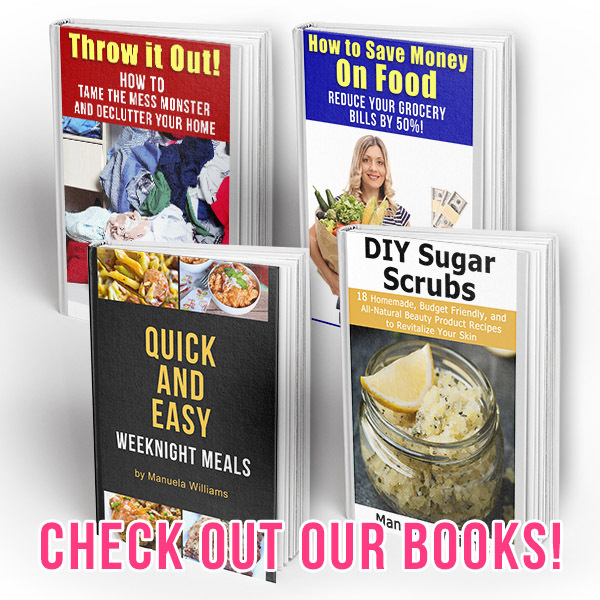 This post contains affiliate links to Amazon and Etsy, which means that I may earn a small commission from some of the links in this post. Thanks for supporting this site! Please see our Disclosure Page for more information.